1. 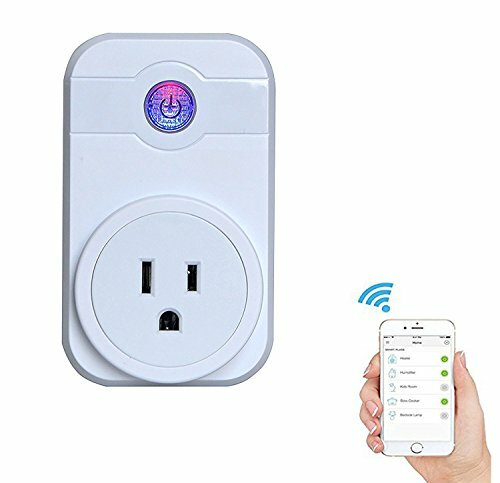 For 1st time to pair the smart plug with your phone: please make sure the wifi smart plug is connected to the same Wi-Fi which your smart phone is connected. 2.4G Wi-Fi is essential. If your Wi-Fi router is Dual-band with 2.4G and 5G, please select 2.4G Wi-Fi. After initially setting, you can access to other Wi-Fi or 4G/3G/2G cellular networks on your phone or mobile to control the wifi smart plug. 2. Please do not put the smart plug far away from wifi router or poor wifi signal place, the connection is going to drop. 1. Plug the wifi outlet into a three-prong outlet, you'll get a rapid blue and red flashing light blink. 2. Download "eFamilyCloud" app, register with your phone number, then connect your Wi-Fi (2.4G Only) to enter to the home page. 3. Click "ADD DEVICES" button at home page, then click "Confirm indicator rapidly blink". You'll see "Connecting now". When it comes to 100% connected, you've already "Successfully added 1 device." * At "Connecting now" step, you may experience "Failed to add" . Just click "retry" button. If the smart plug can't be connected with the App after you tried 3 times, reset will be a good solution: Press and hold the power button for 6 seconds, then press the button to turn on again, retry connection process on app after the smart plug rapidly blink again. How to connect with Alexa? 1. Launch alexa app, click "skils", discover "eFamilyCloud" app to enable skills. 2. In the alexa app, click "smart home" then click "devices", to search and connect your smart plug revise name for your voice control). If you have any questions about this product by GOSTAR, contact us by completing and submitting the form below. If you are looking for a specif part number, please include it with your message.